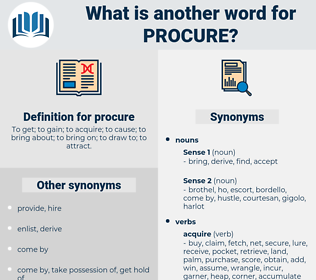 What is another word for procure? 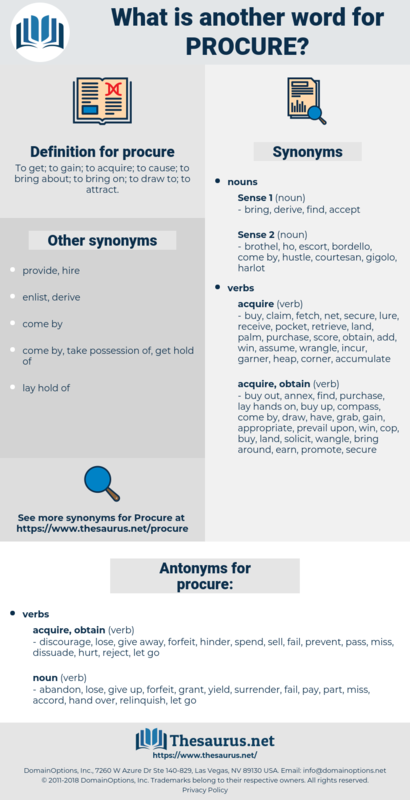 To get; to gain; to acquire; to cause; to bring about; to bring on; to draw to; to attract. done, hire, supply, extract, find, furnish, extort, afford. discourage, lose, give away, forfeit, hinder, spend, sell, fail, prevent, pass, miss, dissuade, hurt, reject, let go. relinquish, accord, grant, hand over, pay, surrender, part, abandon, give up, yield. Their contributions to the commissariat are almost nothing, and the armies are always obliged to procure their stores from the central provinces of Russia. At some houses there was not one person able to rise and attend upon the others; all were dying or dead and to increase the misery of their situations, the springs had dried up, and in many places they could not procure water except by sending many miles. patent, copyright, suborn, enlist, engage.